Handy Backup can save data from Android-based devices such as smartphones and tablets. It stores Nandroid backups in a device memory only, where these data are prone to risks. However, in junction with Handy Backup that is able to move Nandroid backup to PC, it can work great! Nandroid backup is a method of saving a copy of device’s NAND memory data using a special software and a root privileges for this particular device. Doing it requires some skills and carry a potential risk for any data stored on an Android device (including damaging the very OS). At other hand, the Nandroid backup is a single way to make an Android backup just from the device firmware. If you are constantly modifying your NAND memory in search of an optimal custom Android version, then you need to back up your basic device OS. With Handy Backup, it is simple! Firstly, you must grab a root privileges for your Android device (ask Google about how to do it). In addition, you will need to obtain a custom recovery tool. 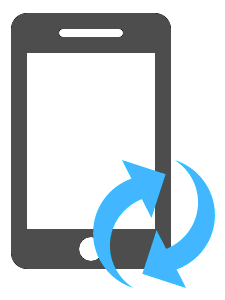 After rooting a device, run a custom recovery tool (TWRP or CWM). Then please follow the next sequence to create a Nandroid backup. Go to the "Backup" section. Choose the partitions you want to back up. Swipe to the right at the bottom to make a backup. Reboot a device after the backup completion. Go to "Backup and Restore" and choose "Backup". Reboot a device after successful completion. That is all. Now you have NAND backup. TWRP: a "TWRP" folder in a device data memory. CWM: a folder located on a path /data/media/clockworkmod/backups. Memorize the exact backup location for your system recovery tool for a next step. Usually, you can do this action manually just by plugging your device into a USB slot and copying a backup folder to your PC. However, with Handy Backup, you can fully automate this process to avoid errors and flaws almost inevitable in a case of manual exchanging. Select a "Computer" data source and choose your device as the external USB drive. Locate your Nandroid backup folder (see above) and mark it. Select all other backup parameters, such as storage media and encrypting, as you wish. On a Step 6, schedule the backup task by plugging this USB device into your PC. 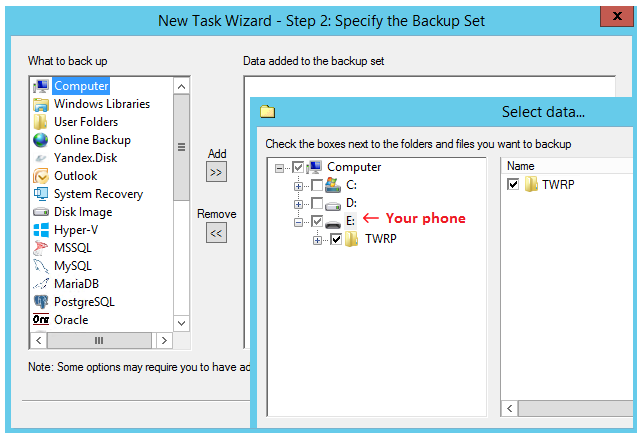 Finish the TWRP backup to PC task creation. This task will automatically back up all content from your Nandroid backup folder into your PC each time you will plug your Android device into the PC, regardless of which USB slot you will use for it. 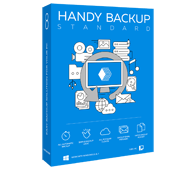 Get Handy Backup Standard, a reliable Nandroid backup software! Why to Create a Nandroid Backup Copy on Your PC? For a security. You won’t lose or forget your NAND backup from an accidental change of data on your mobile device if you have a firm and stable copy of Nandroid backup stored in your computer. Having this external copy, you may be sure that you can restore Nandroid backup at any time! To restore your NAND content from a backup, call again for a custom recovery tool and choose the restore option at the backup section. Again, give a time to perform the restoration, and then reboot your device with a restored Nandroid backup. That is all. You can want to reload a Nandroid backup content from your computer to a device before the restoration. To do it, you may create a restoring task in Handy Backup, or simply copy the needed files to your device via some file manager, as Handy Backup preserves a native data format.